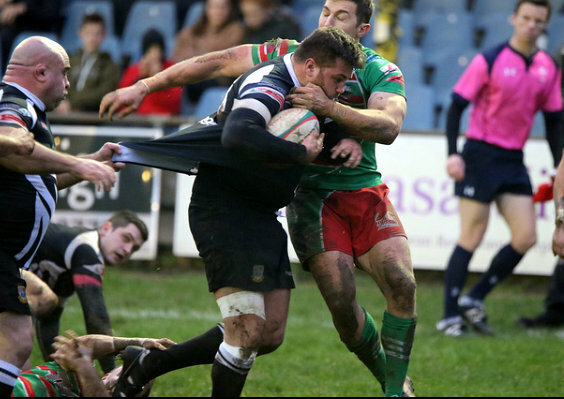 Any hopes Brynley Toms and his Bedwas teammates had of building momentum following the stirring comeback against Merthyr just before Christmas evaporated as clinical, well organized Ebbw Vale clinched a deserved win 38 - 17. Ebbw were quickest out of the blocks and dominated possession for the opening 10 minutes and were soon 6 points to the good courtesy of two Rhys Jones Penalty Kicks. Against the run of play it was Bedwas who claimed the first Try which started deep in their own half and culminating in a race for a hacked on loose ball between Joe Scrivens and Toby Fricker, Scrivens succeeded to set up the supporting Tom Hoppe for a Try which went unconverted. Ebbw’s response was almost immediate as Carl Meyer was given time and space to power through the home defense for a Try Converted by Rhys Jones. Fly half Jones was in great form and he set up Number 8 Lewis Young to break through a disorganized Bedwas defense to put flanker Lloyd Evans in for a Try. Jones keeping up his 100% record by adding the Conversion and followed it with a Penalty to take his side 23 - 5 ahead at the interval. Jones added another Penalty two minutes into the second half to open a twenty one point lead. With fresh legs on Bedwas set about rescuing something from the game. Two Try’s in five minutes courtesy of a George Gasson Try following a rare loose pass in the Ebbw midfield and then replacement Dan Crimmins who barged through from close range. Scrivens converted Gasson’s try to reduce the Ebbw lead to nine points. Once again Ebbw quickly reasserted their advantage as a fine passing move resulted in a second try of the afternoon for Carl Meyer though the conversion was delayed whilst the referee consulted his Television Match Official. The ensuing delay must have upset Jones’ rhythm as the conversion attempt went wide. With the clock approaching the 80 minute mark Bedwas’ recent woes in the scrum resurfaced as props Chris Budgen and Ramaz Rukhadze were both sin binned and a Penalty Try awarded to complete the scoring.